If you are a current wholesale member check this out! You can earn some FREE EXCLUSIVE PRODUCTS that are not for sale to anyone else! By enrolling new wholesale members in doTERRA you can earn the Aspire blend, One blend, Jasmine, or Rose essential oils exclusively for members only FREE! Not only do you get to take advantage of this promo, they get FREE stuff as well through the New Year New You promo! 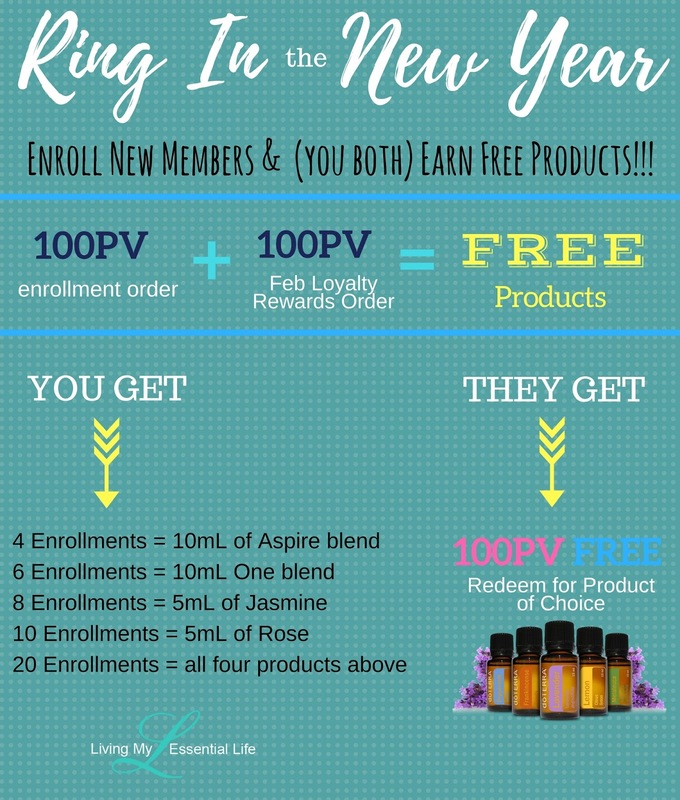 Sign up 4 new Wellness Advocates or Wholesale Customers January 1 – February 28 with a 100 PV enrollment order, have them process a 100 PV LRP order the following month of enrollment, and receive a 10 mL of Aspire blend. Sign up 6 new Wellness Advocates or Wholesale Customers January 1 – February 28 with a 100 PV enrollment order, have them process a 100 PV LRP order the following month of enrollment, and receive a 10 mL One blend. Sign up 8 new Wellness Advocates or Wholesale Customers January 1 – February 28 with a 100 PV enrollment order, have them process a 100 PV LRP order the following month of enrollment, and receive a 5 mL of Jasmine. Sign up 10 new Wellness Advocates or Wholesale Customers January 1 – February 28 with a 100 PV enrollment order, have them process a 100 PV LRP order the following month of enrollment, and receive a 5 mL of Rose. Sign up 20 or more new Wellness Advocates or Wholesale Customers January 1 – February 28 with a 100 PV enrollment order, have them process a 100 PV LRP order the following month of enrollment, and receive all four of the above products (Aspire, One, Jasmine, and Rose). *The promotional items do not stack. Individuals will receive the oil equal to the number of qualifying enrollments that they have. Members can only earn more than one oil, by meeting the requirement of 20 New Year, New You enrollments. Wellness Advocates must hold all qualifying enrollments until March 15, 2017, in order to qualify. Holding your enrollments means that your enrollees must keep you placed as their enroller until March 15 if you would like them to count as one of your enrollments for this promotion. Preferred Member upgrades to a Wellness Advocate qualify if a 100 PV enrollment order is placed and includes the upgrade fee. Retail Customers do not count as qualifying enrollments. Reactivations DO NOT count toward this promotion. No exceptions will be made in this regard. PV is NOT always equal to the cost of an order. Before completing the enrollment order, the new Wellness Advocate or Wholesale Customer must verify that the order is 100 PV or more. Enrollment orders and Loyalty Reward orders cannot be changed, adjusted, or combined to qualify for the promotion. Enrollments outside of the qualifying time period (January 1 – February 28, 2017) do not count toward qualifying enrollments. No exceptions will be made. If you have any questions regarding this promotion please email me at LivingMyEssentialLife@outlook.com or doTERRA corporate at promotions@doterra.com. There is a limited supply of these very rare oils, so please be aware they cannot guarantee an exception can be made.